...and: it's fourth generation warfare, not fourth dimensional. although I guess that was the dimension I was in when I wrote the initial post. dear ones....no need to redirect to rotten tomatoes. it is a movie about something not good. I couldn't give less of a toss about the poor tortured consciences of some people operating remotely piloted vehicles on behalf of their governments. If they can't take a joke they shouldn't have joined. Next. Yeah; they're all drones, no cojones. MJK wrote: Yeah; they're all drones, no cojones. Sure, it's through the front gates of retard town, but keep it going! The judges have accepted that response. nowonmai wrote: I couldn't give less of a toss about the poor tortured consciences of some people operating remotely piloted vehicles on behalf of their governments. If they can't take a joke they shouldn't have joined. Next. oh mon ami, im sure NOONE gives a sh*t about the 'pilots'. "Michael Gross has written a thoughtful, lucid book about the dilemma of 'asymmetric conflict,' as when a nation confronts a terrorist movement or other insurgency that does not observe the laws of war and, more important, does not have a structure or employ tactics against which conventional military force is fully effective. To be limited in fighting such a group by the conventional laws of war is to fight terror and insurrection with one hand tied behind one's back; and, depending on the gravity of the threat posed by such a group, the question becomes how far if at all the nation should depart from the conventional rules of armed combat. 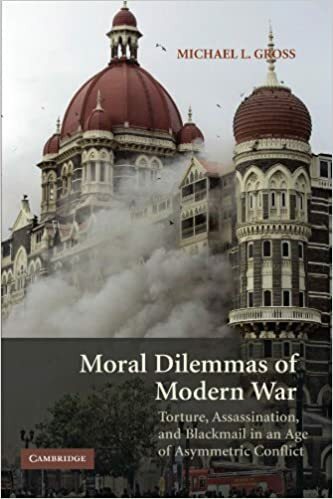 The need to balance military necessity with humanitarianism, with regard to such practices as brutal interrogation, assassination, and disabling but nonlethal gas, is the theme of the book; and as Gross states in the conclusion, 'dogmatism is not the answer." A joke, (we the US) exercised what we called Guerilla warfare in WW2, today we call it terrorism because we are so soft and impotent that it's embarrassing. Why is not clear? As ex-Army this is absurd. We fight to win for the USA (our families) and should not afford any quarter, period. Yall/ see the Syrian Pilot burn to death in the cage? I have to say, that's about as as bad-as it gets and my Son's will not offer no quarter in this century. Burn them in Hell! what exactly are you b*tching about? i think you are someone i know.if so, pm me. if not, im sure someone here supports your point of view. ...and btw....g warfare is not 'terrorism'.